Although some oral health concerns are fairly common over the age of 50, if you adopt a proactive mindset and educate yourself, these concerns do not have to be common for you. Anticipating and recognizing changes in your mouth can help you be on top of your health in this area, so let’s take a look at the main ones you have to watch out for. The most common oral health concern you’re likely to experience as you age is dry mouth. Dry mouth, also called Xerostomia, can be caused by a number of contributing factors. This includes the over-consumption of drying beverages like coffee and alcohol as well as the frequent consumption of salty foods. Another big offender is the medication we take over a lifetime to treat various illness. There are at least 400 medications that can contribute to Xerostomia including medications for high blood pressure and depression. It is important to note that the need for dentures is not a must as we age. Today, healthier living and better access to dental care has reduced the percentage of seniors wearing dentures to 27% from nearly 50% just a few decades ago. That said, should dentures be a part of your life, or that of a loved one, wearing properly-fitting dentures is critical. Dentures that cause pain or shift in the mouth tend to alter a person’s eating habits. Nutrition deficits occur if healthy, but hard to chew, foods are avoided. As we age, we sometimes find ourselves having to contend with physical ailments limiting our desire to maintain good oral care. Arthritis, vision loss, or injuries are a few of the most common. To combat these concerns, using a floss pick or flossers to get between teeth can be helpful. Electric toothbrushes and water flossers also are helpful aids. Additionally, regular use of oral rinses can assist in dislodging difficult to remove food debris while adding to the overall health of one’s mouth and gum tissue. The old expression “long in the tooth” actually refers to how our teeth appear to “lengthen” as we age. In other words, it’s a fancy way of saying our gums are receding. While some degree of gum recession is natural as we age, this predisposes us to cavities along the root structure of the tooth where enamel doesn’t exist. So, as one ages, flossing, brushing and rinses are more important than ever. 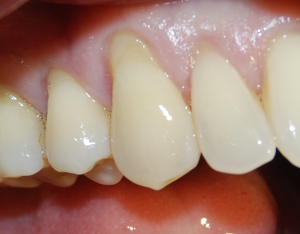 Natural gum recession is one thing, and a part of aging. Gum disease, however, is preventable. Each of the above items in this list can contribute to gum disease and good oral care can prevent it. Failing to do so can lead to a need for dentures at its most extreme, pain and swollen gums at its least. If a tooth is lost due to trauma or decay, and not replaced with an implant or other prosthetic, it can have serious complications for the health of the jawbone. Teeth could shift out of place and fall out, and bone tissue may be resorbed back into the body. Retirees without dental coverage can sometimes cover the expenses of dental care on their own; sometimes they cannot. But a lack of funds to take care of one’s teeth can be devastating to the health of our mouths as well as our overall health. So we need to plan for two things: a care routine that allows us to take care of our teeth as much as possible and some sort of financial backup plan for when problems do arise. Fortunately, Adams and Cheek Dentistry has an in-house dental savings plan for patients without dental insurance. You may read more about this plan at http://raleighncdentistry.com/acdc-adams-and-cheek-dental-savings-care-program/ or contact us at http://raleighncdentistry.com/contact-our-office/.